Rogue River, OR (April 4, 2018) – Wagner Meters announces a new monitoring device that tracks and documents ambient temperature and relative humidity conditions discretely and constantly, even when you are away from the job site. Called the Smart Logger™, the monitor is a temperature and relative humidity data logger utilizing the latest Bluetooth® 4.0 technology. The 2-inch square monitoring device sends data to the Smart Logger™ app that Wagner Meters offers for free for both Apple and Android smart devices. The app connects the Smart Logger™ device through a Bluetooth® 4.0 connection. This enables you to transmit and record ambient relative humidity and temperature data, and send the data reports via email, directly from the job site. Simply install the monitoring device on a wall, or other out-of-the-way location at your project site, then set the desired parameters on the free Smart Logger™ app. Now you can collect and store up to 12,000 readings of ambient temperature and relative humidity conditions over a time period of up to 300 days, depending on frequency of readings and strength of transmission sensor. When you return to the job site one or more days later, use the app for fast, convenient data collection via Bluetooth®. After downloading the data to your mobile device, you can quickly send a report to the general contractor (GC) or your client. The Smart Logger™ monitoring device is small, lightweight, easily mountable, and highly accurate. In addition to storing temperature and relative humidity data, the Smart Logger™ can also be utilized during the wood flooring acclimation process and the storage of wood flooring. In some cases, you may choose to leave the device behind after the job is completed to record ambient conditions in the event of a flooring issue in the future. “The Smart Logger™ is the solution for residential and commercial installation professionals who depend on accurate and consistent ambient temperature and relative humidity readings as they engage projects that require exacting conditions. It enables them to determine whether or not job site conditions are right for a successful installation,” says Jason Spangler, Wagner Meters’ Flooring Division Sales Manager. “For example, consistent documented readings of ambient conditions provided by the Smart Logger™, will tell an installer if the job site conditions have met ASTM F2170 parameters and are appropriate for the wood flooring installation. The installer will also have time-stamped documentation that will show if job site conditions have deviated from serviceable at any time during the monitoring process. Using the app, ambient condition reports can be emailed to customers or other stakeholders with a few simple keystrokes,” Spangler adds. Anyone using a smart device with Bluetooth® 4.0 or above can download and install the Smart Logger™ app for free from the Apple App Store or Google Play. The Smart Logger™ device itself can be purchased online at www.wagnermeters.com/smartlogger in single packs, 5 packs, and 20 packs. Wagner Meters manufactures technologically advanced wood and concrete moisture measurement devices and moisture measurement systems for wood flooring professionals. 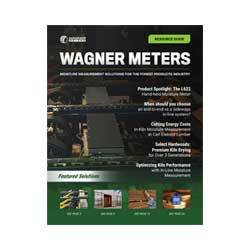 For over 50 years, Wagner’s field-proven moisture meter solutions have helped thousands of valued customers worldwide improve profits, and eliminate wood and concrete moisture-related problems.